You can find lots of fresh Bash Brothers stuff on “The Hard Drive,” our new content page here on the site! It’s part blog, website and company repository, built from our vast and varied footprints in sports media and film. Find Jon’s weekly writings on everything from the NBA Playoffs to Mississippi college baseball and the oral history of “The Wire.” Get hype with original Bash Brothers videos and go historical with deep dives into Mississippi sports history. We’ll also have the highlights from Jon’s two weekly ESPN Radio shows on thezone1059.com : The Jon Wiener Show with Jackson Meadows and The Golf Show with Jon Wiener and Stuart Conway. We’re still building the Hard Drive and have lots more exciting things coming. So keep logging in and connecting others as we work to bring you regular, consistent Bash Brothers media content for your enjoyment! From November: Bash Brothers gets hype for the Egg Bowl! We may not have films, but we do have shirts. And hats. As my friend Jimmy Quinn, local bartender and comic (read: sage), quipped at this weekend’s Cathead Jam, “Why start your own company if not to make t-shirts?”(By the way, Cathead Jam was awesome. Cheers to the distillery for putting on another great event that drew a huge crowd of people from all across the metro area. Jackson can work.) The new shirts feature our unique logo on the front and website on the back, in a distressed black-and-white print that’s as soft as it is stylish. Basically they’re hot AF so get yours ASAP! Also get crowned with our coveted Bash Brothers trucker caps, soon to be available in “dad cap” style to go with the original flat-bills. 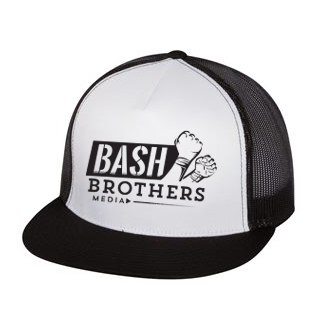 Get your gear today on our new shop page and become a part of the Bash Brothers team! Flannery O’Conner’s “A Good Man Is Hard to Find” may be the best short story every written. It actually has little to do with our hiring practices, but it’s a catchy heading and worth pointing you to it. (“She would have been a good woman,” The Misfit said, “if it had been somebody there to shoot her every minute of her life.”) We’ve added a few men to our Bash Brothers team who fortunately don’t need shooting to be exceptional. Our graphic designer Alex Gant has been an absolute wizard with our many logos, projects, website additions, and all that hot new gear you just ordered. He is also behind much of the cool graphic work you’ll see in the Between the Pines episodes. We’re also thrilled to have assistant editor Joshua Clegg working with us on a regular basis. Josh is a product of Hinds Community College and University of New Orleans film schools, and brings a keen technical ability and diligence to our editing process. Just as importantly, he’s a really chill, earnest dude who educates us on pop culture, fast food, and video games. Cheers to Alex & Josh! At Bash Brothers our passion is sports, but we also believe in using our video and storytelling expertise to help make Mississippi a better place. You will see in our “Work” portfolio a number of projects on challenging social causes in the community. We are excited to be producing another such story on Willowood Developmental Center, the only multi-purpose agency in the Jackson metro area for children with mental and physical developmental special needs. It’s a heroic facility where workers, parents and children fight battles far greater than any encountered in sports. At Willowood, miracles happen every day, yet resources and support grow scarce. We look forward to telling the remarkable story. Bash Brothers film story for the 50th anniversary of the temple on Old Canton Rd. Don’t miss Jon on ESPN Radio (thezone1059.com) two nights a week: Mondays at 6 for The Jon Wiener Show with Jackson Meadows and Wednesdays at 6 for The Golf Show. We’ll have highlights from both shows on the Hard Drive every week. Be on the look out for our official People’s Guide to Mississippi Golf Courses coming soon, to be released in two parts on the Drive. The difference in this one from most golf course lists? We discuss the best courses in the most important categories to all golfers, rather than simply ranking the with precious little context or helpful information. We’re gearing up for a big fall that, in addition to the premier of Between the Pines, will debut a couple of other new productions right in the Bash Brothers wheelhouse. Make sure you stay tuned here on the site and on social media for the latest!